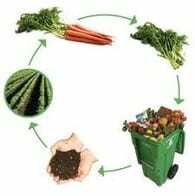 Composting is the biological decomposition of organic waste caused by worms, bacteria and other organisms. Composting materials such as yard debris and food waste is an environmentally sound way to significantly reduce your solid waste output. The Marquette County Landfill offers free compost and organics services to all residents. Below is a list of materials accepted. Our municipalities and local school systems may request a trailer from the landfill to fill with their food waste. Click here for more information. Note: The following lists materials accepted at the landfill site. All loads must be covered with a tarp. NO stumps or limbs that are more than 2″ in diameter! Stumps and any tree limbs/brush over 2 inches in diameter. These items are charged a rate of $49.50 per ton and you must have a valid landfill permit. Most transfer stations have a compost pile that is free to its residents. Many of these are strictly for brush or yard debris. Call your local transfer station to find out more information.